Battles have been waged by politicians, activist judges, special interests and lobbyists across the nation who seek to remove the will of the people. Not sure how? Just email us by clicking here, and we will let you know. Nunez is at it again. After failing to extend his term limits with Proposition 93, Nunez is working on legislation with Assembly Minority Leader, Mike Villines (R-Clovis) that, if passed, would place a measure on the November ballot, which would extend term limits for California Legislators. California voters soundly defeated Proposition 93 in February, despite Nunez and his cohorts spending over $16 million dollars to extend legislative term limits. Another ballot measure asking for an extension for legislative term limits could cost California taxpayers millions of dollars. On February 5, Californians voted 47 % — 53 % to uphold term limits. Prop. 93 is a shell game created by Senate President Don Perata and Speaker Fabian Nunez to allow themselves to stay in Sacramento milking the taxpayers for more lavish trips at taxpayer expense. The truth is that Proposition 93 extends members of the California Assembly, by expanding the number of years they can stay in office. This move will leave California families stuck with the same corrupt politicians working for special interests and lobbyists, instead of the hard working families across the state. 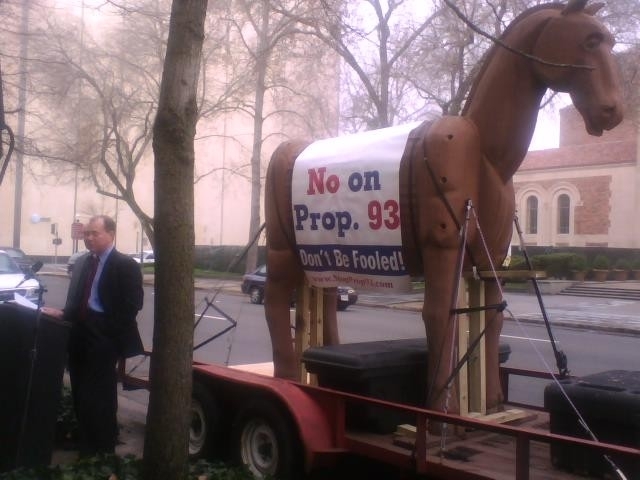 Many of the politicians pushing Prop 93 will be term limited this year if the measure fails. true intentions of Proposition 93. Excellent Piece from the Press Enterprise on Prop 93. SJR 1, a bill aimed at repealing South Dakotas term limits laws passed the legislature before adjournment. Question J will now appear on South Dakota’s ballot in November, asking citizen’s if they wish to repeal the South Dakota Term Limits law. Based on recent polling conducted by Pulse Opinion Research, 64 percent of South Dakota voters favor the current term limits law, and plan to vote against Question J in November. The polling results can be viewed here. THE NEVADA STATE SUPREME COURT ISSUED A RULING ON JULY 25 UPHOLDING TERM LIMITS FOR STATE LEGISLATURE AND LOCAL OFFICE HOLDERS. THE VOICE OF THE PEOPLE WAS NOT IGNORED. Nevada politicians refuse to accept the voice of the 70 percent who voted to place term limits on state legislators in 1994 and 1996. State politicians have coordinated with local judges in an effort to repeal Nevada’s Term Limits law. On June 26, the Nevada Supreme Court announced that it would hear arguments on the constitutionality of term limits for members of the state legislature and local governing bodies. The case of Miller v. Burk was heard on July 14th, and a decision is pending. Their argument stems from the Court’s decision to break up the term limits question into two questions after first passage by the voters in 1994. The question was broken into term limits for judges and term limits for legislators. Following the passage of term limits on legislators in 1996, an identical complaint to the one being filed now, was ruled on by the State Supreme Court. Now that the time has come for several politicians, they are once again seeking to use the same shell game which has already failed once. US Term Limits filed an amicus curiae brief July 8 on behalf of Nevada citizens who have expressed their support for term limits by passing them with an overwhelming margin in 1994 and 1996.